Meet the DSPTCH case, the perfect vowel-free traveling companion for your iPad mini. It’s a simple envelope-style sleeve, only it has a bunch of unobtrusive straps and pockets on the outside to wrangle your on-the-road essentials. The iPad mini is clearly best left naked, like a small child running around at a German family gathering. But even I – a committed iPad Naturist – use protection whilst traveling. And as this is pretty much the only time I’ll need anything bulkier than a Smart Cover, it makes some sense to ditch aesthetics and go for something purely practical. Which isn’t to say that the Dsptch is ugly. In fact, it’s rather handsome considering its utilitarian abilities. The nylon sleeve has a simple elastic band running across the front, stitched to cut it into three sections. At the bottom is a pocket. 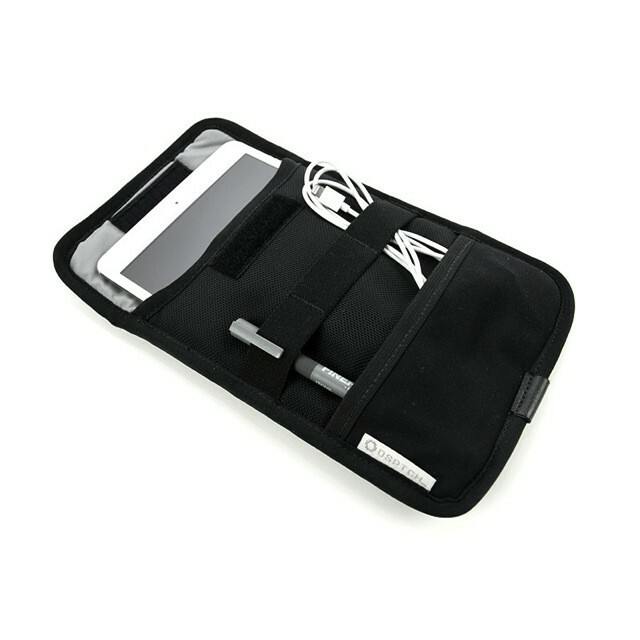 This lets you stow things like styluses and cables in the open, and squirrel away camera connection kits and other widgets in the smaller corners. It looks ideal. It keeps the iPad safe but not crazily overprotected, and it holds all the cables and adapters you usually need when levying home for more than a day. It’s also $42, which isn’t super cheap, but neither is it particularly high priced. Oh, and there are versions for your Mac laptops and other sized iPads.